We knew this day would come but now that it is here, we are all feeling, well, a bit blue. Perhaps no one more than the Little Blue Man himself. For the past year plus, the Little Blue Man has diligently attended to the needs of the construction site next door, rain or shine. Looking very official in his Obayashi-issued hard hat, snappy blue suit, reflective vest and light saber suspended like a samurai sword, he was in charge of leading the daily calisthenics at 8 a.m., directing traffic when trucks clogged the road, distributing bento lunch boxes, and, at the end of the day, after everyone else had gone home, padlocking the property. But no matter what was going on on site, he always had a smile for us and a pat for Pippi. Once he even proffered her a tennis ball! What a guy! But today the building was handed over to its owner, completing the property's transformation from a decrepit Japan Tobacco employee compound to luxury apartment complex. Over the past year or so, we watched the new construction emerge from the ground, the big jobs gradually giving way to fine-tuning as subcontractors worked overtime to plant trees, put up a stone wall, install signage, and apply other finishing touches. No doubt the process culminated in a formal ceremony of some sort since this is Japan. In anticipation of this day, the Little Blue Man approached me earlier in the week as I was exiting our garage. He motioned for me to unroll the window, removed said hat, bowed and informed me solemnly that Friday would be his last day. While we are glad to have the inconvenience of living next to a construction site over, we are sorry to see him go and decided his impending departure merited a little hand over of our own. Let's back up for a moment ... a couple of months ago, on the occasion of her birthday (and sort of on a dare), Eve asked the Little Blue Man if she could take his picture. At first he was a bit surprised, but then he stepped up to plate and, as he always does, got the job done. That's our Little Blue man for you! Ever since that day, he has greeted Eve as "Jyu-san-sai" or "the 13-year-old." So yesterday David and the girls printed that photo (it depicts the Little Blue Man in the company of Abby, Eve, Pippi and a friend) and Francia baked Blondies. This morning, on the way to school, we presented the Little Blue Man with the photo and the treats. Imagine his surprise! Like most proper Japanese people, he did not open the parcel in our presence but thanked us profusely and bowed deeply (the deeper the bow, the more significant the occasion). After a longer-than-usual exchange of pleasantries, Pippi and Francia went off to play ball and I escorted the girls to school. Upon my return, I caught a glimpse of the Little Blue Man in an uncharacteristic moment of repose. He had our blue (of course!) envelope in hand and was gazing at the photo. When he saw me, the Little Blue Man grinned broadly and proudly informed me that he had shown his co-workers the picture. Apparently, he told Francia that he plans to keep the photo forever! Good-Bye, Little Blue Man! We'll miss you! 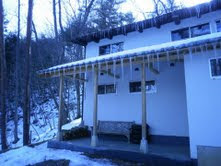 This is the front porch of our house in Minakami and the impressive collection of icicles that welcomed us this past weekend. Beautiful but lethal. Below is an array of photos of our neighbors' houses. Though clad with metal roofing today, I bet that most were once topped with thick thatch. In fact, it may still be underneath. 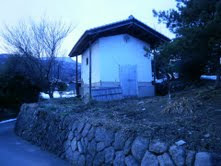 Unfortunately, Japanese thatch does not last that long. It is expensive to replace and only possible if the right roofer can be found -- thatchers are a dying breed. With its red coloring and hipped ends, this one is particularly photogenic all year round. But you have to admit, it does look especially good against the snow. 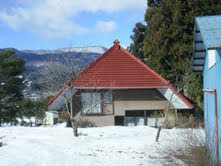 Throughout Japan, roof shapes vary, reflecting regional climate conditions and different agricultural pursuits. 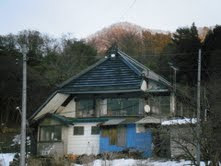 Though located in Gunma, the houses above and below seem to be variants on the "broadside helmet" shape found in the neighboring Nagano and Saitama Prefectures. 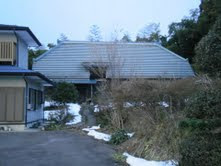 I love the way the massive roof hovers protectively over the house pictured above. 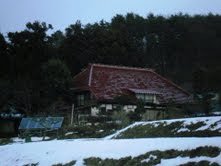 This house has clearly seen better days but the roof shape still does a good job of keeping the snow from accumulating. Can you see the vague resemblance between its end elevation and a Japanese helmet? In the case of storehouses such as this one, the outermost roof is slightly elevated for ventilation (there may be a second layer of some sort underneath). Made of thick, plaster-like masonry for fire protection, these tiny, little buildings were once entrusted with the family's most precious possessions. Wonder what it is in there today. Consequently, they do not have many windows but a little fresh air keeps the contents from rotting. 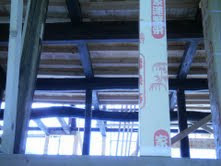 And extending the eaves protects the building from heavy rains. This house is under construction nearby. 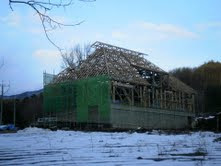 The client, a doctor who owns property further up the hill as well, is rebuilding a minka farmhouse as his weekend home. If you look carefully, you can see the original, dark wood frame that the carpenters are incorporating into the new construction. I am sure the finished product will be spectacular though I wonder about the siting. It seems too close to the road and the utility tower nearby is unsightly (though hopefully not visible inside). On Sunday, when the carpenters were not on site, Abby and I did a little investigation. Taking advantage of the tree's bent shape and its inherent structural strength, some of the original roof beams are curved. In lieu of nails or hardware, the old beams are lashed together with rope, enabling the easy deconstruction, transport and rebuilding of these historic houses. It is nice to see someone breathing new life into this one. Lastly, even this petite, roadside shrine has not just one but two roofs of its own. 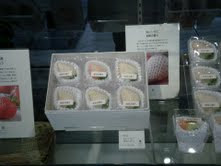 Unlike their American cousins, Japanese strawberries are usually red outside and white inside. I have gotten used to the two-tone pigmentation and now associate it with the outstanding flavor of berries in Japan where the season starts at the end of November and lasts until May when we are sick of eating them anyhow. Today I had my first encounter with white strawberries. The conspicuous absence of color struck me as, well, odd. What is a strawberry without its red skin? The very essence of this luscious fruit was lost. To some these albino berries may look exotic but to me they looked sickly and anemic. 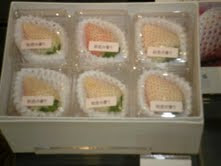 Intended as gifts, the berries are sold at a specialty fruit seller, not our local Gourmet City supermarket. They come in six packs priced at Y6300 but also may be purchased individually in little cellophane-wrapped cups for Y1100 (about $12) apiece. The size of a plum, each berry is considerably bigger than normal and completely blemish-free. What is the proper way to eat said fruit? Knife and fork? Fingers? I probably should have bought one just so we could try it. Oh boy. I don't have much good to say about the McDonald's ad campaign currently assaulting the Tokyo subway system. In fact, I feel a little embarrassed by this incongruous pair of posters suspended from the car ceiling. 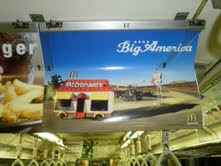 Titled Big America, one page depicts a roadside scene with a pick-up truck and a cheap motel in the background. In the foreground stands a movable McDonald's outlet ready to hit the open road. It probably ought to have a "wide load" banner draped across its rear. 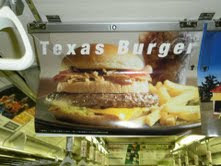 The twin poster features the Texas Burger -- an over-sized sandwich topped with bacon, something fried, mysterious sauces and, of course, a hefty hunk of meat. What are these images really saying? Last night, while cruising around AM/PM, I had the good fortune to discover Tot and Bit, two tiny confections geared towards the limited quantity chocolate consumer. Manufactured by competing confectioners, Lotte and Bourbon respectively, the two products undoubtedly target two different palettes. 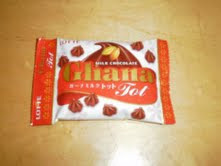 Contained in a small, red packet, Tots are little nubbins of the brand's best-selling Ghana chocolate. Though petite, their shape is reminiscent of your basic chip crossed with the swirly stars of my youth (the kind that came in the cardboard box with the little cellophane window). Tots' presentation had more eye appeal than I expected. And their ridged shape added a certain sensory dimension. But, as is often the case with this kind of mass-produced candy, the chocolate was long on sweet but short on bona fide cocoa flavor. By contrast, Bit is a small hunk of chocolate and will appeal to those who like biting into something meaty. In short, it is a small bar with a big bar persona. Composed of twin rectangular blocks, the square's increased depth compensates for its lacking length and width. 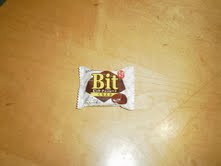 In terms of taste, Bit was kind of cloying. Again, the chocolate flavor was sub par. Plus the center had an off putting, creamy consistency. Was the chocolatier simply trying too hard? Special for winter, Bourbon's little bar is bound to have a short shelf life. Let's hope the spring version is a bit better. 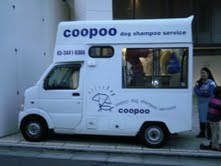 This is a mobile dog grooming parlor. Containing all the accouterments needed for a well-scrubbed pooch, the salon-on-wheels makes house calls. I have seen this tidy, little truck roaming around our neighborhood many times but this is the first time with a canine client in tow. The dog did not look too unhappy. But then again I have heard it said that one can get used to anything. Now if we subjected Pippi to this treatment, I am certain she would mutiny. We once took her to a do-it-yourself dog bath. They supplied the tub, drying chamber and all the necessary potions. Needless to say, the venture was not too successful and now we bathe her at home. And only when she gets really grubby or overheated in the summer. Tokyo car owners are required by law to provide off-street parking for their vehicles. I imagine the same rule applies to motorcycles. This bike-owner has devised a rather clever solution to what could be a sticky situation given the heavily trafficked location on a narrow street off of Dogenzaka. Treating architecture like furniture, he or she embedded an elevated shelf into the side of a building (probably a restaurant) where the two-wheeler sits comfortably. At least until it gets side-swiped. A short walk from our home is a little design complex called Le Bain. Devoted to the well-appointed bath, it contains a boutique featuring boudoir-related goods, two gallery spaces and, fronting the street, a marvelous, wagashi sweets shop (blogworthy in its own right). Flanked by two penthouse-like apartments upstairs, a courtyard unites the ground floor's disparate pieces. Downstairs is a showroom for the most elegant tubs, basins, showers and commodes on the planet. Heaven on earth for those prone to composing ideal bathrooms in our heads. Lured by a poster for their current exhibitions, I wandered into Le Bain's galleries yesterday. Changing every fortnight or so, the avant garde displays tend to feature glass, ceramics, textiles, lacquer and, my personal favorite, wearable works of art. 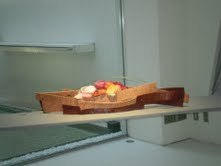 At the moment twin installations of jewelry by Tomomi Matsunaga are being shown. One side features a collection of mostly brooches made from gold and silver-plated (or at least painted) fabric strips. Not usually my thing but the jury is still out. 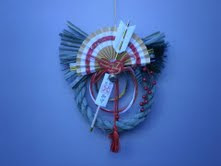 The other side is showing wonderful pieces made of bamboo. I particularly like the bracelets but they could be hard (impossible) to wear. Uniting the two spaces, the artifacts on both sides are fittingly displayed in oblong, wedge-shaped frames made of colored cloth. Suspended from the ceiling with invisible guidelines, they practically float. Very architectural and consistent with the jewelry's strong geometric character. But the highlight of the exhibition is not meant for bodily adornment. 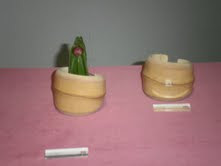 An ikebana piece, it consists of an assortment of round blossoms contained in a boat-shaped vessel. Authored by the artist, the vase is made of laminated strips of cloth or vinyl held together with metal rivets. This technique is reminiscent of the jewelry, albeit on a larger scale and in a different color scheme. Dramatically lit from above, the spectacular arrangement is unexpectedly beautiful. No visit to Chicago would be complete without a taste of pizza. 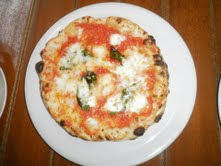 But none, not even Barack's favorite from the Italian Fiesta Pizzeria, can compare to Savoy's sublime fare. As much a feast for the eye as the palette, the experience begins upon entry. Located conveniently around the corner from our home, the tiny parlor is visually dominated by the wood-burning pizza oven. As in many Japanese restaurants,the counter is the place to be though there is a table or two. On offer are just two types of pies (rumor has it that pizza guy can be cajoled into making a blond version as well). We always opt for the Margarita. After feeding the fire with a fresh log and taking its temperature (proper heat is key), pizza guy moves into high gear. 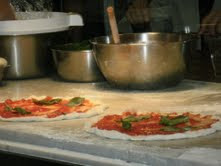 Part artist and part chef, he starts by gently lifting a mound of dough from one of several covered, wooden trays. Perfectly round and smooth, the dough balls look more like mochi rice cakes or steamed bean paste buns. After scattering some flour on the marble counter, he gently massages the dough into the perfect shape, roundish and very thin (except for the edge that holds the filling in place). Next he paints the pale, white surface with a spiral of bright, red tomato sauce. Crumbled chunks of fresh mozzarella cheese and a few basil leaves follow. A sprinkle of coarse sea salt, a swirl of Sicilian olive oil and the masterpiece is ready for baking. Wielding his paddle, pizza guy deftly delivers the paper-thin pie to the depths of the brick-lined oven. 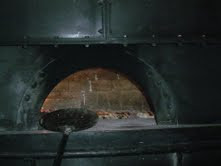 As the pies cook, the cheese melts and begins to bubble, the crust singes and pizza guy chats us up, always keeping one eye on the goings on inside the oven. He turns the pies once or twice and maneuvers them around a bit. But after no more than five minutes they are cooked to perfection and, steaming hot, placed before us. The taste is indescribably delicious. Each colorful element -- cheese, tomato, basil -- asserts itself. But the mellow oil blends their flavors together. Easily cut with a fork, the soft dough absorbs the filling's juices but the puffy crust remains chewy to the last bite. January in Japan. I like the quiet hush that settles over the city at the beginning of the month. After literally ringing in the new year with 108 strikes of the temple bell, everyone holes up for a few days. Shops close. Offices shut down. And feasting with friends and family becomes the focus. But by the time we got back from our U.S. sojourn, the city was up and running again, most of the new year's decorations sadly discarded. I did have the good fortune to find this treasure still affixed to the front door of a martial arts studio in our neighborhood. Isn't it lovely? As we ring in the new year, I feel I ought to take stock of my blog. I have been at this for a few months and am taking a brief hiatus while in the US (don't worry ... plenty of new posts to come in 2010). I kept a journal steadily from the ages of 13 to 30 so I am no stranger to written record keeping. The blog allows me to note those stray bits of information that might otherwise get lost in the proverbial shuffle. This digital format is also an ideal opportunity to organize and articulate myriad thoughts or reactions and illustrate them with photos. I also like sharing my observations with all of you -- would that a few more of you would leave an occasional comment! Sometimes it gets a little lonely out here in cyberspace. But enough whinging.